If fitness and weight loss efforts have not achieved your goals for a body that is firmer, more youthful-looking and more proportionate to your overall body image, a surgical lift may be right for you. Thigh lift surgery reshapes the thighs by reducing excess skin, and in some cases fat, resulting in smoother skin and better-proportioned contours of the thighs and lower body. The success and safety of your thigh lift procedure depends very much on your complete candidness during your consultation. You’ll be asked a number of questions about your health, desires, and lifestyle. Thigh lift surgery may be performed in an accredited office-based surgical facility, licensed ambulatory surgical center, or a hospital. If your thigh lift is performed on an outpatient basis, be sure to arrange for someone to drive you to and from surgery and to stay with you for at least the first night following surgery. Be sure to ask your plastic surgeon questions. It’s very important to understand all aspects of your thigh lift procedure. It’s natural to feel some anxiety, whether it’s excitement for your anticipated new look or a bit of preoperative stress. Don’t be shy about discussing these feelings with your plastic surgeon. Incision patterns vary based on the area or areas to be treated, degree of correction, and patient and surgeon preference. 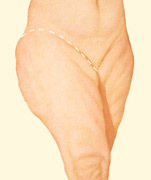 One common technique used for a thigh lift places incisions in the groin, extending downward and wrapping around the back of the thigh. The underlying tissue matrix will be reshaped and tightened, and skin will be reduced and re-draped resulting in more proportionate and smoother body contours. You may qualify for a minimal incision medial thigh lift that involves an incision only in the groin area. Your surgeon will determine what’s appropriate. The smoother tighter contouring that result from a thigh lift are apparent almost immediately, although initially obscured by swelling and bruising. You may be required to wear a compression garment for several weeks following your procedure to minimize swelling and support the tissues as they heal. Following a thigh lift, skin quality is dramatically improved both in appearance and feel. The decision to have thigh lift surgery is extremely personal, and you’ll have to decide if the benefits will achieve your goals and if the risks and potential complications are acceptable. You will be asked to sign consent forms to ensure that you fully understand the procedure and any risks and potential complications. When your procedure is completed, dressing or bandages may be applied to your incisions, and you may be wrapped in an elastic bandage or a compression garment to minimize swelling and to support your new contours as you heal. Small, thin tubes may be temporarily placed under the skin to drain excess fluid or blood that may collect. The results of a thigh lift are visible almost immediately. However, it may take several months for the final results to fully develop. Some visible scars will remain, but the overall results are long lasting, provided that you maintain a stable weight and general fitness. As your body ages, it is natural to lose some firmness. However, most of your initial improvement should be relatively permanent. Prices for a thigh lift can vary. A surgeon’s cost may be based on his or her experience, the type of procedure used, and the geographic location of the office. Many plastic surgeons offer patient financing plans, so be sure to ask.